the problematic core construct was that in order to be sane . . . you could and must deny black femininity. and somehow breathe. the fundamental fallacy being . . . that there is no separation from the black simultaneity of the universe also known as everything also known as the black feminist intergenerational sphere. This “black feminist intergenerational sphere” constitutes the texture of the text, what Gumbs might call its spirit weaving. The M of M Archive encompasses memory and matrilineage, “miracle and mayhem and mass incarceration” and more. The M also calls on M. Jacqui Alexander whose visionary 2005 work Pedagogies of Crossing serves as a specific ancestor. Each meditation in M Archive ends with an endnote referencing Alexander’s text. The archive becomes palimpsest, a black feminist crosscurrent of “feminism, sexual politics, memory, and the sacred.” M Archive proceeds “after and with” Alexander, “after and with” black feminist legacy. This is a major contribution. This is you beyond you. After and with the consequences of fracking past peak oil. After and with the defunding of the humanities. After and with the removal of people of color from the cities they build. This opening note pairs with a closing “Periodic Kitchen Table of Elements,” a rich bibliography (again shouting out Kitchen Table Press) that brings together diverse sources “organized by atomic number.” Along with black feminist texts, this list also includes works by Grace Lee Boggs, Gloría Anzaldúa, J. Dilla, Prince, Benjamin Banneker, Alice Coltrane, Boyz II Men, and Jorge Luis Borges. M Archive proceeds “after and with” these texts too; the text frames its own visionary context and marks itself as a crossroads. These opening and closing notes situate the seven sections of the book, which exist as elemental invocations. “Archive of Dirt” invokes earth, burial grounds, storage spaces and new digging. “Archive of Sky” invokes wind and lungs, screaming and singing. “Archive of Fire” invokes global warming and fossil fuels as reclaimed bodies and breath. “Archive of Ocean” invokes the middle passage and the necessity of tears. In order, they describe: “What We Did,” “What We Became,” “Rate of Change,” and “Origin.” In these sections and the last two, “Baskets (Possible Futures Yet to Be Woven)” and “Memory Drive,” we find critical meditations on flowers and food, walls, whales, love, fat black women, queerness, birthing, basements, science, basket weaving, capitalism, activism, prison and school abolition, social media, millennial speech, our “complicated networks of evasion” (drugs, trips, “yoga pilates hot yoga zumba jogging and other fitness-watch trackable activities”) and more (148). Gumbs also intersperses altered images of the periodic table of elements throughout the text. These become visual reminders of the transformed elemental quality of the end of the world. The end of the world is no joke! This text is clearly ambitious. More compendium than chronicle, the writing is poetic, dense, and often solemn with glimmers of dark wit. M Archive unscrolls as sacred text, refusing a simple before and after. Instead, time blurs. Before burrows into another before. Memory muses a moving spiral. Future origin stories appear including “the critical black marine biologists” who connect “bioluminescence in the ocean and the bones of the millions of transatlantic dead;” “the descendant of stagecoach mary [who] started making a tangible and dirty archive of the clean digital world,” and “the dj named narcissus” who made a mixtape and “tried to replicate the tired rhythms of their feet across the dust.” Gumbs also slips in mentions of Audre Lorde, Saartje Baartman (the so-called Hottentot Venus), and a particularly powerful contemplation of eighteenth century poet Phillis Wheatley. M Archive spends much of its time, though, on how we all went wrong, how we “suffocated meaning under diction” and willfully ignored the lineage of our own stories. While the text can at times feel like the warranted chiding of a stern mother, M Archive speaks truth about our catastrophic moment, how we sold out our humanity and had to recover ourselves. Gumbs also pinpoints the moment, hopefully now, when people decided to change their behavior /change back into something better / something forgotten. what did we each do then? . . . when we lost exactly who we needed to save. when we knew there would be no tomorrow. what did we each do then? how did we keep breathing past it (because we are the ones that did). they dug for those memories and stacked them in a row. that’s how. that’s how we learned to get through this. Notice here how “we” and “they” are split but must operate as the same and how breathing and excavation of memory become new knowledge. While this knowledge is new to us, Gumbs reminds us that our foremothers always knew, already had the solutions. We simply had to / have to choose to remember, to know, to recognize them as ourselves. eventually they all remembered that they were their own great-great-great-great-grandmothers . . . they began to acknowledge their foremothers as the daughters they had always wanted to have. they started being, just being, the mothers they had always wanted to be. . . it was the act of choosing, of choosing each other. again. Choosing in M Archive becomes a practice of the body. As a black feminist performance artist, I loved the embodied rituals throughout the text, the moving, dancing, singing and screaming. Post- historical trauma, post-and-within-current apocalypse, survival here must be recovered from and through the body, re-incorporated in solidarity with others. we took off our leaden clothes and we skipped out of our concrete shoes and we went barefoot enough to bear the rubble we had created just before . . . we touched each other’s hands and found them warm and ridged with remembering. we traced the lines and found home again and again. home was like a pulse. home was where the hurt was. we lunged and pressed toward each other’s chests. we let longing lead past our labored lack. we held each other’s hands. they did not break. M Archive advocates for taking time and space to remember, to touch, play, hold, practice divination, practice freedom, and practice embodiment. By the end, the black feminist researcher “was aware of her function as a technology for remembering. specifically, she activated her body as a connection site for all intergenerational knowing and reveled in the edges of herself.” This revelry becomes writing for the future. Emitting Afrofuturism and centering black female imagination, M Archive embodies critical future writing now. It illustrates not how we are trained to write in graduate school, but how we should be — from the body, from the heart, from our nightmares and dreams. Along with the text’s muse M. Jacqui Alexander and the aforementioned black feminist geniuses, M Archive should be read with Hortense Spillers (who inspired Gumbs’ previous work Spill) and Sylvia Wynter, two other visionary black feminist scholars who reconfigured notions of humanity. M Archive also takes its place among recent extraordinary volumes on black life: Claudia Rankine’s Citizen, Saidiya Hartman’s Know Your Mother, Christina Sharpe’s In the Wake: On Blackness and Being, and Stefano Harney and Fred Moten’s underground blockbuster The Undercommons. All of these works challenge traditional modes of scholarly writing and allow for the personal, the ancestral, the communal, the political, and the creative. Like these works, M Archive also tackles epistemology, how we can make or recover knowledge within oppressive systems, and how this knowledge can fortify us and our communities. Gumbs writes: “Consider this text an experiment, an index, an oracle, an archive. Let this text be as alive as you are alive. Might be enough.” This last phrase speaks to the power and contingency of black feminist speculation. 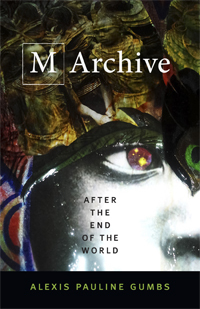 M Archive: After the End of the World should be read / aloud / mightily / in black light / in trouble/ after and with / your mothers / and sisters / now / and for the future. Gabrielle Civil is a black feminist performance artist, poet, and writer, originally from Detroit MI. Her writing and translations have appeared in Obsidian, Small Axe, The Third Rail, Art21, Aster(ix), and Kitchen Table Translation. Her memoir in performance art Swallow the Fish was named by Entropy as a “Best Non-Fiction Book of 2017.” Starting in Fall 2018, she will teach Creative Writing and Critical Studies at the California Institute of the Arts. The aim of her work is to open up space.